Ever scroll through your Twitter home screen to view your own tweeting history? You’ll go blind looking for anything in particular and you’ll scroll forever. Of course, who really has a need to dig through old tweets? If you manage social media for a client or as part of your job, you’ll probably find that it’s a useful endeavor. If not now, you will eventually need to do something with those tweets. I know there are umpteen good social monitoring tools out there to do the analysis. This is different. 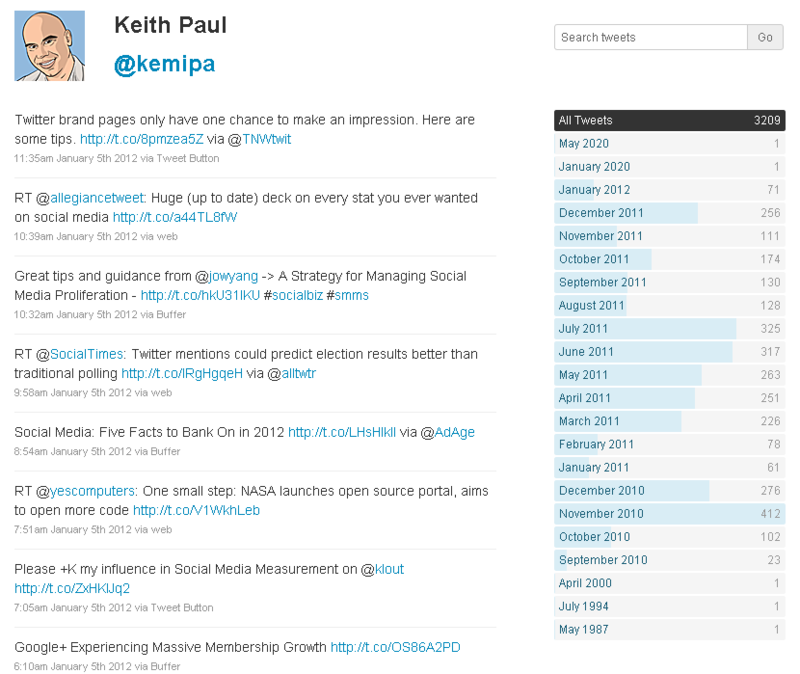 You will OWN your tweets in a database of your choosing. You’ll be able to slice-and-dice like the Ginsu guy. Say goodbye to the limits of whichever tool you might use. Enter Archive My Tweets, a nifty app written by a friend of mine, Andy Whalen (@awhalen). This app grabs your most recent 3,200 tweets and puts them in a database you control. You’re limited to 3,200 tweets as imposed by the Twitter API, but if you create your archive early enough, those limits are moot. Check out my tweet archive. Not only was it fun to roll my non-developer sleeves up to install some code, it’s a blast browsing through this stuff.